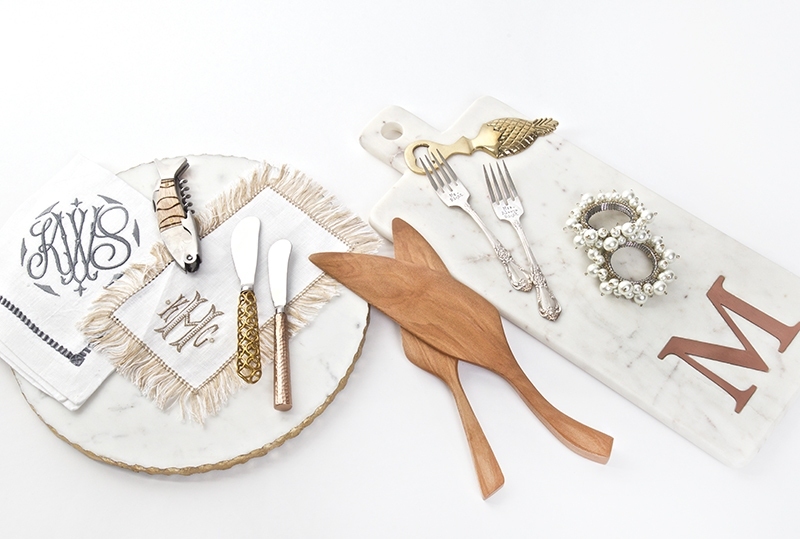 Two piece marble board set features gold-foiled textured raw edge and spreader with netted gold handle as well as white marble paddle serving board with copper plate initial inlay with metal spreader at The Basketry. Monogrammed European linen hemstitched dinner napkin and fringe cocktail napkin at The Linen Registry. Wooden cake knife and serving spade with hand engraving and vintage hand stamped silverware set at Nola Boards. Silver napkin holders with various-sized pearl decoration at Hazelnut New Orleans.